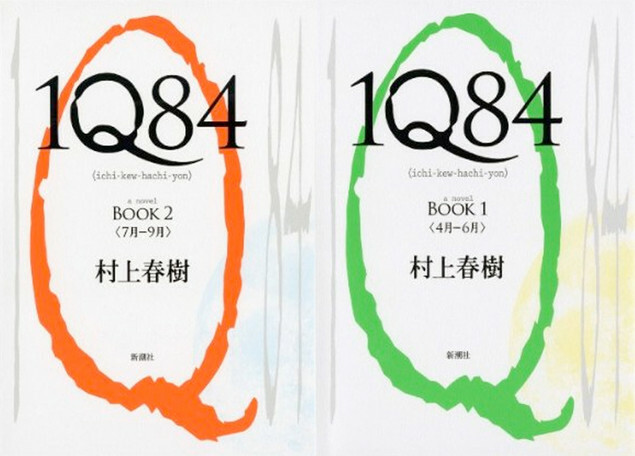 I spiral down: Jen reads... 1Q84 books 1 and 2... in Japanese! 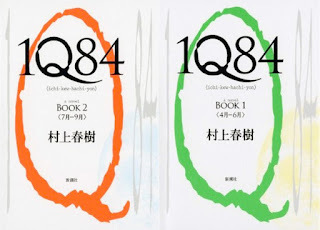 Jen reads... 1Q84 books 1 and 2... in Japanese! I try to read a bit in Japanese every day.. and what better to read than some Murakami?? These took me a LONG time to get through... I can remember back in... when was it, 2009??? When they first came out, being really excited, but planning on waiting until the pocket sized version came out. For those who don't know, Japanese paperback books are normally about 10 x 15 cm big, and are the perfect size to fit in a bag... so I wanted that version, so I wouldn't have to cart around huge hardbacks around with me. Normally, the smaller version comes out about a year after the hardcover, but with this, it was so popular that it only came out last year!!! Crazy. So, I'd been waiting for about 3 years to read them, haha. Recently though, I've been making sure that every time I can sit down on one of my commute trains (I get 2 different trains and sometimes a bus every day, fun! ), I would spend the whole time reading instead of messing about on my phone. So I finally finished the 4th book, the second half of book 2! (This is getting a bit confusing)... And, I don't have book 3 yet! What was I thinking? I should have had it ready! I forgot that it's around halfway when Murakami books tend to get addictive, and the last half of this was making me want to "accidentally" forget to get off at the right stop and carry on reading instead. Hehe. For anybody who has read this in English - how is Aomame's name dealt with in English? Because in Japanese there's a fair bit about how strange a name it is, and I was just wondering how that would have been translated. Because obviously, to somebody who doesn't know a lot about Japan or hasn't lived here, the strangeness of the name doesn't come across at all. In terms of Japanese, this wasn't too difficult to read, but I would in no way recommend this to people who aren't used to reading in Japanese, simply because of the length.
" It's still the same kind of characters... doing the same kind of things, and then something weird happens to them... But I really like that! :D "
Hahaha, saaaaame! I really really loved 1Q84, and YES you need to get book 3 immediately if not sooner! There is quite a lot in the English translation of like 'oh, her name means green peas (?)' but I don't think it really comes across as that weird because you're just like 'oh, it's a Japanese name' which, to be fair, are all weird? Or, not weird even, but just different, you know? So I don't think it's something that translates all that well. BUT I STILL LOVE IT! I still haven't managed to get book 3 yet.. mainly because I'm trying to save money this month after all my money somehow disappearing last month (grr! ), and going to book shops inevitably ends in purchases, hehe. I found out that one of my friends at work has read it, and the only comment that she made on it was about how she loves Aomame's name and thinks it's really funny, hehe. I wonder what she would have thought about it had she read it in English! Maybe she wouldn't have liked it at all! Heh.